SpiceJet, Tata Shop Share and Smile, Ebay, Spar and much more! Catch the latest information and updates from the world of Gift Cards, brought to you by Qwikcilver – Everything Gift Cards! Presenting to you the October edition of the Qwikcilver newsletter. As with the previous months this time also we have new launches – including a segment first, which showcase the growing popularity of Gift Cards. Our Enterprise solutions team have for you a case study that showcases our powerful reward system that helped simplify a leading food delivery app's reward woes. On our B2C front, we have continued keeping our consumers interested and engaged with a plethora of offers from India's leading brands. 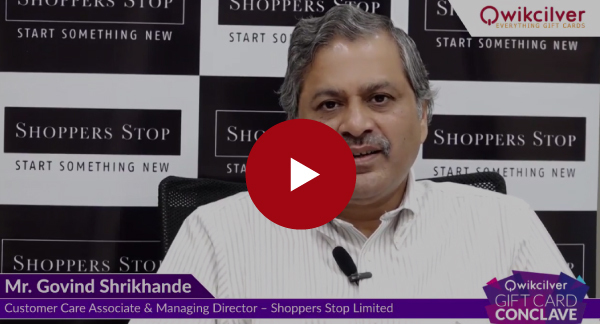 Introducing the QwikTube section, where we have the head of one of India's most prestigious retail stores talk about the strategic importance of Gift Cards. We hope you like reading what we have in store for you! As always do reach out to us for any feedback you would like to give us. This issue we explore how one of India’s hottest startups and food delivery app company chose Qwikcilver to power their employee program. This program was used to reward their delivery executives who ensured timely deliveries and longest login hours. The key drivers of the program were to provide exciting rewards and an simplified user experience. Read more on how Qwikcilver was able to deliver joy for our client in our one page case study. Diwali is here! And so is Diwali Gifting! However, Diwali gifting is no easy task – with so many expectations from our loved ones, one is bound to feel the pressure of what should be a fun affair. And when gifts go wrong, hilarious it may be, the whole experience can still leave a bad taste. This month we have put together for you a list of ‘don’t dos’ this Diwali which you can read at our blog. Last month at Woohoo we had attractive consumer offers that were run on various Gift cards and E-Gift Cards. The main promotions include 15% – 25% discount on Cleartrip cards, 30% discount on Gaana.com gift cards, 10% discount on premium fashion brands like Arrow, Flying Machine and other Arvind brands. The best part is these offers are still on Woohoo.in in addition to other exciting offers from Caratlane.com, Titan and Thomas Cook. Check out more offers on Woohoo by clicking on button below! The festive season is here and what better way to gift than with a Gift Card! SPAR Hypermarkets, one of our esteemed clients have showcased their their Gift Cards prominently in their stores. Called “Festive Gifting Ideas” SPAR highlights the emotional connect of gifting through a SPAR Gift Card. With growing acceptance of the Gift Card as a premier gifting option, consumers are switching to Gift Cards faster than ever and this is just the beginning! Throwback to Asia’s first ever Gift Card conclave, where Mr. Govind Shrikhande, Customer Care Associate and Managing Director, Shoppers Stop had this special message for Qwikcilver and also highlighting the growing strategic importance of Gift Cards in every retailer’s arsenal. Click on the image to watch this video.